When it was announced that Amazon is going all-in on games, it was a great sign for the industry. Amazon is, by all accounts, a behemoth. Anything the company decides to throw its sizable weight into is undoubtedly one to watch. In the case of Amazon Game Studios, this is the MMORPG genre and the game New World. Set in, as the title describes, a New World. This is a world where a land between Europe and America was located in the 17th century. A land with magic and savage wild creatures, a land where you can make your own fortune. It’s not exactly dissimilar to many other MMO’s out there. If that’s the case, how does New World stand out? In quite a few ways, to be quite frank. There’s crafting and building system in New World, though this isn’t too different from other games. It’s what has been done with this system and how it interlinks with everything else that is drastically different. With the setting of a new world comes a whole new land to explore and settle. This is exactly what you’ll be doing – settling. The area of New World has a number of territories on it and you, with your company, will inevitably want to settle on one of these and call it home. Each of these territories only covers a select area of land and as a result of this, a very limited range of resources. This will encourage you to personally explore but also you – and any players you have teamed with as a company – to expand or even trade. 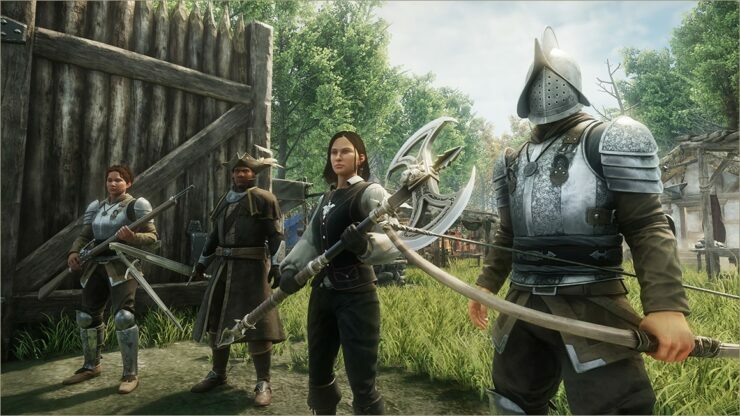 One of the major elements of the game is the crafting and building system and the specialisations that come with that (more on character specialisation later). As you settle in a territory you will build up the settlement that controls the area and even specialise that. Will you have a settlement that acts as a resource centre that then feeds another territory of yours, creating an internal chain? With how competitive the world will likely be, you will need to trade, negotiate and even ally with others. You can even tax other players that want to build in your territory, should you let them. Or you could decide to be a true rogue. The developers did make it clear there is a justice system in place within the game and you can get a bounty on your head. There wasn’t a huge amount of detail revealed on this feature, but it was made clear that these criminals could be hunted down and it’s certainly a way to play the game. Even the starting safe zones aren’t truly safe for these criminals. As for your character, there are no rigid classes. Everything is free form and you will guide your own progression as to how you want to play. You don’t have to focus on a combat skill, you can have a purely non-combat style character who has fantastic abilities in crafting, mining or even cooking. Of course, you can be a fighter, which in this case you could be an expert in Siegecraft if you want. Whatever you want to be, you can. Should you decide to be a fighter then you’ll find an engaging combat system, unlike most regular MMO’s. You move, dodge and roll in a way that feels more like a third-person action game because it actually relies on accuracy. Using your stamina to attack, dodge and roll feels similar to Mount and Blade: Warband. Not only is the physical combat strong, so is the ranged. With ranged weapons, you won’t find yourself clicking on an enemy and hitting at will. You will need just as much accuracy as if you were playing Battlefield. The hit detection, from what I saw, was surprisingly impressive for such an early stage. What will be truly engaging is when true large battles come into play. Particularly so with the inclusion of siege weapons. For the hands-on I was able to play, I managed to use explosive barrels. After planting these against the wall of a village, we set them off and raided the camp. It was simple but engaging. I can only imagine how fun a larger battle will be. Just be aware, friendly fire does happen and blowing up a barrel next to an ally will kill them. There are a number of elements that haven’t been completely decided yet. The landmass of New World also has regular features like islands, peninsulas and large stretches of water. At this moment in time, the developers are investigating different modes of travel. 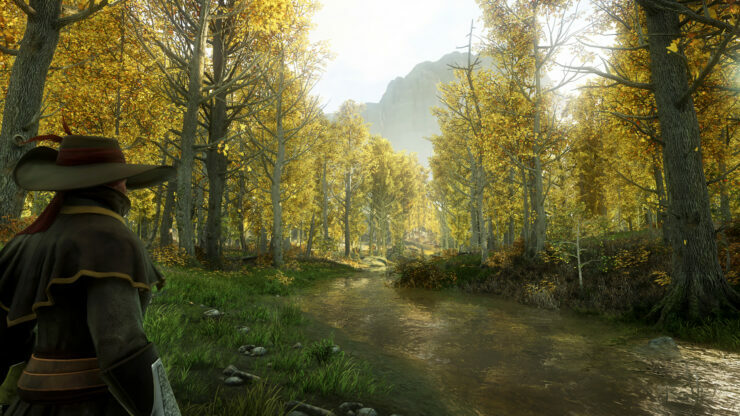 When starting the game, most players will begin at a shoreline and work their way in. I asked exactly what the size of the map. The area I was shown is roughly 200 square miles. It’s maybe a quarter or a fifth of the total land mass. In the initial stages, only a select area of the map will be open. As such, only a limited number of players will be on a server at any time. From what I was told, it will start at around 500 players during closed alpha and move up from there. The full map will support around 10,000 players through the use of Amazon’s server technology. What was truly impressive is just how densely packed the world is. 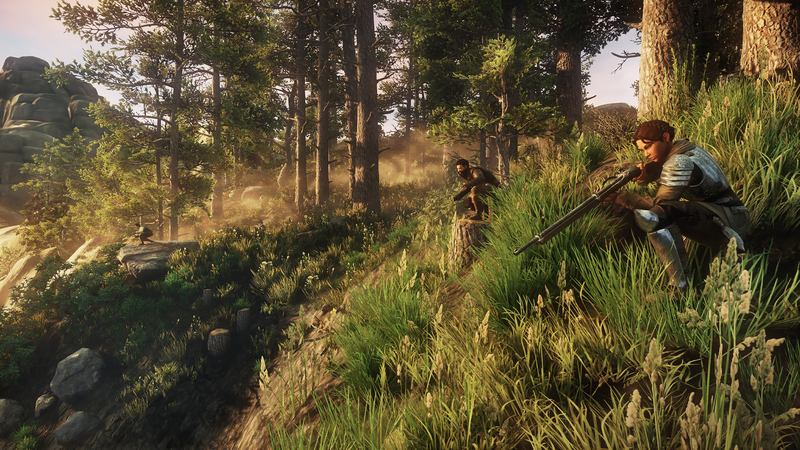 Even at this stage – barring a few graphical glitches I encountered – the game looked fantastic, running on the Lumberyard engine. Little details, like just how dense the forest was, shrubbery and undergrowth. The reflection of water and the flora growing there. The fauna on show, from wolves to a hulking bear that I managed to kill with the help of another player. At this early stage, it also ran brilliantly. As for monetisation, they aren’t currently talking about it. When it launches there will be a retail price for entry to bring players in. I was told that there will be microtransactions, but there will be no loot boxes and it will not be pay to win at all. 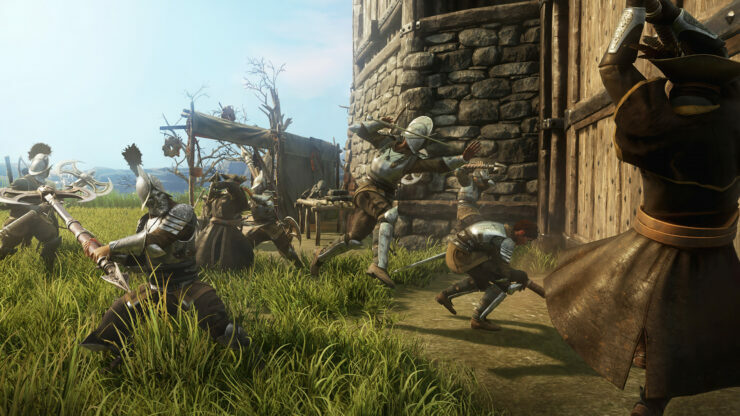 At the time of talking, the studio hopes to bring players in at a single price and build the game as a live service and encourage further growth. 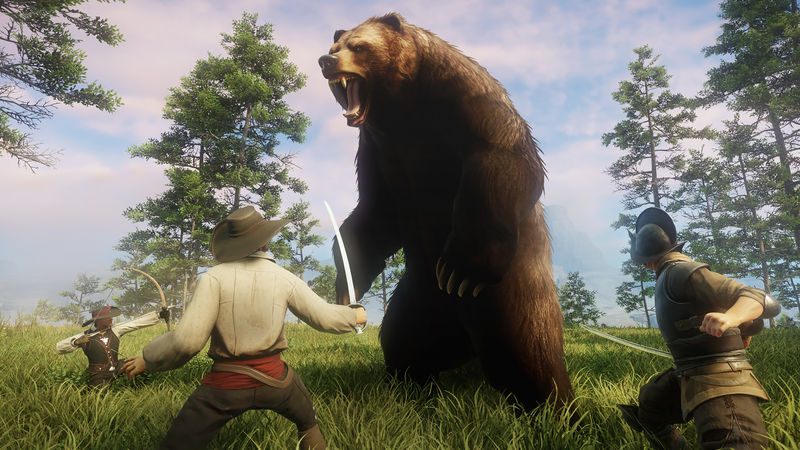 Amazon Game Studios are taking on a very tough challenge with New World. The MMORPG genre is littered with the corpses of fallen entries, even those by huge publishers (Warhammer Online by EA, for example). The genre has been relatively untouched for a decent amount of time by the larger studios, so Amazon stepping into the fold is bound to turn some heads. What should turn heads is exactly what New World already has, and is proposing to have on release. This is a PC MMO with a territory system and a real economy that promotes co-operation or war. It also highlights the huge economic cost of a war, making it a costly and expensive thing for you to start. It’s a living, breathing world where almost everything can be interacted with and one where you quite literally choose your own path. Considering what I saw was an actual development build, not something made just for Gamescom, It’s hard not to be extremely excited about the potential of New World. Will we see it released soon? Highly unlikely to see an actual release before 2020. Still, the Alpha test will start soon. You can sign up for it on the official website.